The therapeutic success of biological agents, especially the tumour necrosis factor (TNF) inhibitors, has opened a new chapter in the book of therapies for rheumatoid arthritis. Nevertheless, more than 50% of patients may not respond by > 50% improvement. New compounds have recently entered the treatment arena. One of these is rituximab, which depletes B cells, and another, abatacept, interferes with T-cell co-stimulation. However, although these agents may be effective in a number of patients who fail to respond to TNF blockade, they only rarely induce remission and overall 50% response rates do not exceed those with the TNF inhibitors. Among the major proinflammatory cytokines, IL-6 plays a pleiotropic role both in terms of activating the inflammatory response and osteoclastogenesis. Here, we review recent phase II trials of tocilizumab, a humanized anti-IL-6 receptor antibody that achieves a significant therapeutic response rate. Severe manifestations of rheumatoid arthritis (RA), particularly rapidly progressive and severe disability but also vasculitis and amyloidosis, have become rare. This is attributable to progress made over recent decades in treatment strategies that effectively suppress disease activity. We have learned to use traditional disease-modifying antirheumatic drugs early and intensively, especially methotrexate (MTX), which is considered the 'gold standard' of care for patients with RA. However, the responses of patients with RA to treatment with so-called standard disease-modifying antirheumatic drugs such as MTX, alone or in combination, is suboptimal in a significant proportion of patients . 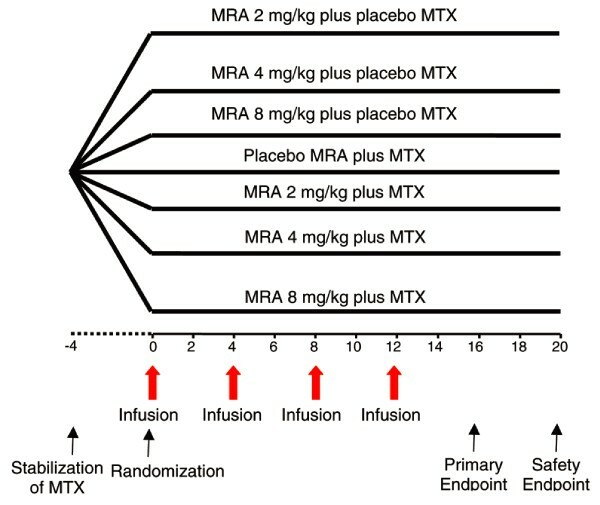 The more recently developed biological agents, when used in combination with MTX, yield better clinical responses in MTX refractory or naïve patients; for example, as many as 75% of patients treated with an anti-tumour necrosis factor (TNF) biological drug were reported to exhibit clinical responses . Moreover, the TNF blockers have particular efficacy in inhibiting progression of joint damage. Despite the undoubted benefits attributable to current biological targeted interventions, in most studies 50% or more of patients with MTX naïve/early RA do not achieve 50% or better clinical improvement in established disease. This unmet need for effective interventions in RA clearly mandates further research, especially when the objective, today, is clinical remission. Nonresponsiveness to TNF blockade and/or residual disease activity, as well as the continuing, albeit slower progression of joint damage in a proportion of patients treated with TNF inhibitors suggest that TNF is not the sole responsible biological target in the disease process, and therefore further novel agents and novel strategies are needed. The ideal profile for a new drug is one that targets a molecule or a cell population that is involved in pathogenesis, with equivalent (or better) efficacy compared with existing therapies in terms of effect on signs and symptoms and progression of joint damage, and with a safety profile similar to or better than that of current treatments. Also, it may be possible to combine drugs that target more than one molecule and pathogenic pathway to increase efficacy further. Following the revolution created by the three TNF blockers already licensed for treatment of RA, new agents have been or are being developed, for example abatacept and rituximab, and new IL-1 and TNF inhibitors. Abatacept interferes with T cell costimulation  and rituximab depletes B cells and thus interferes with autoantibody production and antigen presentation . These and other approaches could be useful for treating anti-TNF nonresponders (for review ). An important cytokine with significant involvement in the immunoinflammatory response, namely IL-6, is the subject of the present review. IL-6 is expressed in a large proportion of cells in rheumatoid synovial tissue but not in osteoarthritis [6, 7]. It has been shown that TNF levels are twice as high in RA as in psoriatic arthritis and 9–10 times higher in RA than in osteoarthritis ; this is also true of IL-6. Similarly, serum levels of IL-6 in TNF transgenic animals (TNF-knockout mice) are considerably elevated, and these animals have progressive and aggressively destructive arthritis . In accordance with these observations, TNF blockade reduces IL-6 serum levels , indicating an inter-relationship between these cytokines. It is important to note, however, that this is a downstream effect and that TNF blockade does not directly block the activity of IL-6. Other articles in this supplement report the pleiotropic activities of IL-6, all of which are characteristic of RA. IL-6 binds either to a membrane-bound IL-6 receptor or to a soluble receptor . When IL-6 binds to the soluble receptor, it is not neutralized but can continue to signal via gp130 . This signalling process is inhibited by antibodies to the IL-6 receptor. Tocilizumab is a humanized antibody that binds both to soluble and to membrane-bound IL-6 receptor. It blocks the receptor complex, leading to prevention of all transmembrane signalling by IL-6 . Two phase II studies, conducted in Japan  and Europe , have already been completed. This study involved three infusions every 4 weeks at a dose of either 4 or 8 mg/kg, with an end-point at 4 weeks after the third infusion. The baseline characteristics of the study groups are shown in Table 1. CRP, C-reactive protein; DMARD, disease-modifying antirheumatic drug; ESR, erythrocyte sedimentation rate; RA, rheumatoid arthritis. Adapted, with permission, from . The results of the study show that an American College of Rheumatology (ACR)20 response at the 8 mg/kg dose of tocilizumab was achieved in the 80% range, as compared with a placebo response of 20%; at the 4 mg/kg dose the ACR20 response was in the 50% range. Likewise, the ACR50 scores were numerically higher than in the placebo group (approximately 40% for the 8 mg/kg dose), and an ACR70 was achieved by approximately 15%, with no response in the placebo group . IL-6 has effect on C-reactive protein (CRP), an acute-phase reactant produced by the liver, and a clear dose response was discerned after 4 weeks. CRP was normalized in the 8 mg/kg dose group, and in the 4 mg/kg dose group there was significant reduction but not normalization, suggesting that 8 mg/kg was the more effective dose. A similar result was found for the erythrocyte sedimentation rate. This CHARISMA study  included patients who had been treated with MTX but still had active disease despite MTX therapy. The study design is shown in Figure 1. CHARISMA study design. Four week stabilization on a fixed dose of methotrexate was followed by randomization into seven parallel arms . Intravenous infusions were administered at weeks 0, 4, 8 and 12, and observations were recorded every other week through to 20 weeks. MTX, methotrexate; MRA, tocilizumab. Reproduced, with permission, from . Copyright © 2006 American College of Rheumatology. Baseline demographics were similar between the treatment groups, with no statistically significant differences (Table 2). Demographic data show that the participants all had long established RA and the Disease Activity Score (DAS28) showed a high level of disease activity. an = 52; bn = 51; cn = 50; dn = 49. CRP, C-reactive protein; DAS28, Disease Activity Score; ESR, erythrocyte sedimentation rate; MTX, methotrexate; RA, rheumatoid arthritis; RF, rheumatoid factor; SJC, swollen joint count; TJC, total joint count. Reproduced, with permission, from . The results for monotherapy revealed that the 2 mg/kg dose was not effective and the 4 mg/kg was effective, but the best results for monotherapy were seen with the 8 mg/kg dose, with a 63% ACR20 response, a 41% ACR50 response and a 16% ACR70 response . However, when tocilizumab was added to MTX, there was a 74% ACR20 response, a 53% ACR50 and 37% ACR70 response for the 8 mg/kg dose group. This was approximately twice as high as in the placebo (plus MTX) group. Thus, tocilizumab monotherapy is effective, and its combination with MTX has even greater efficacy. Essentially, similar data were seen using the DAS28 score rather than the ACR response criteria. Furthermore, there may be sustained effects, as demonstrated for 8 mg/kg monotherapy and combination dose groups, in which there was no plateau to the DAS28 response by the end of the study. Adverse events must be expected with use of a biological agent, especially those related to blockade of the target and its physiological activities. Blocking IL-6 led to increases in liver enzymes as well as serum lipid levels. Elevations in lipid levels may occur, with rapid interference with the inflammatory response . This is reflected by the abrupt decrease in CRP levels. The lipid abnormalities are not necessarily an adverse event because the atherogenic index in the CHARISMA trial was essentially unchanged. Changes in lipid levels have been observed with other anti-inflammatory drugs and with other biologics. During tocilizumab therapy, reduction in neutrophils was observed with neutropenia in a small proportion of patients . Interfering with the immune system often increases the risk for infections, as has been observed with TNF-blocking therapies, and this has also been observed with IL-6 inhibition. In the European study  there were also two cases of sepsis not otherwise specified (in the 8 mg/kg combination group); this potential tendency must be monitored and investigated further in the context of phase III trials. Because tocilizumab is a humanized antibody, immunogenicity and infusion reactions were expected and have been observed. In the European CHARISMA study , for example, five severe hypersensitivity (anaphylactoid/allergic) reactions were observed, but these were exclusively in the low-dose monotherapy groups. IL-6 is an important proinflammatory cytokine and is importantly involved in the pathogenesis of RA. Blocking the IL-6 receptor with tocilizumab leads to significant improvement in signs and symptoms, and leads to reduction in and almost normalization of the acute-phase response. The results of currently completed studies indicate that tocilizumab treatment (as monotherapy or combination therapy) has a safety pattern consistent with that of other biological and immunosuppressive therapies. Large-scale phase III studies are currently ongoing in both Asian and Caucasian populations in an attempt to confirm the reported clinical findings, to analyze the effects of tocilizumab on radiographic progression, and to assess the full safety profile of this new compound. An erratum to this article is available at http://dx.doi.org/10.1186/ar2065. JSS has received financial compensation from and served on advisory boards for Roche and is an investigator in clinical trials of tocilizumab.